We believe we have a responsibility to give back to the Earth and as such formulate fertilizer products that help restore Earth’s balance. All our liquid foliar fertilizer products only use organic ingredients and feature the benefits of Melaleuca alternifolia oil's (Tea Tree Oil) synergistic microbial activity that improves both plant and soil health. 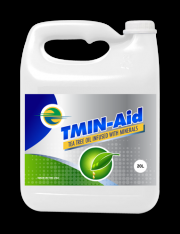 Our patent pending TMIN-Aid fertilizer product lines are 3-1 products, meaning bio-fertilizer, bio-fungicide and bio-pesticide. We blend custom Tea Tree Oil fertilizer formulations to aid the Grower’s efforts in restoring soil health and improving plant quality and yield; with added organic nutrients as required for a specific crop and soil.